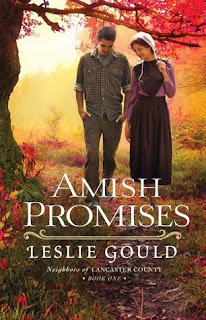 I always enjoy Leslie Gould's books - I recently finished the The Courtships of Lancaster County Series - and love her style of writing. This book was a little different since it not only featured Amish people as main characters, but brought an 'Englischer' family into the story. Another twist I liked was the fact that the Englisch father had been in the war, bringing more complexity to the chapters where the strict Amish father next door had to deal with befriending a soldier - not something most Amish look highly upon. It brought out a lot of emotion and added a lot of interesting layers to the book. I also liked that the book wasn't only following one storyline. It follows both families though their own struggles and emotions, while still keeping the whole story in context and interesting. So, all in all I definitely enjoyed the book, and would happily recommend it!